Due to advances in veterinary medicine and surgery it is becoming increasingly difficult for veterinary surgeons in general practice to be able to offer more complex methods of investigation and treatment for certain conditions. 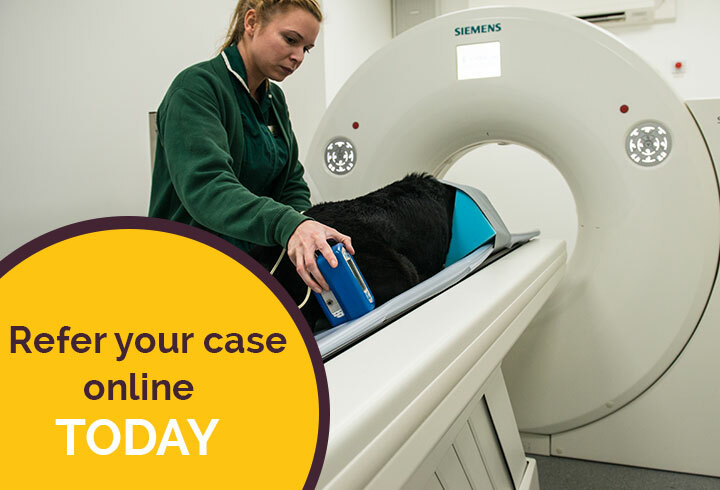 Here at Beechwood Veterinary Hospital we are able to offer more complex treatment options in the disciplines of orthopaedics, dermatology and advanced imaging. Internal referrals within our hospital and referrals from other practices in Yorkshire, Nottinghamshire and Lincolnshire are treated at our hospital on a daily basis. At the hospital we have an extensive inventory of surgical equipment to allow us to investigate and treat the more complex orthopaedic cases we are presented with. Our powerful X-ray machine allows us to take high quality radiographs enabling us to make a diagnosis. Our CT scanner increases our diagnostic imaging skills further. Surgical management can then be commenced in one of our two sterile operating theatres. Management of cases after surgery is especially important and members of our nursing team are available 24-hours a day to care for hospitalised patients. If you are a client from another practice and you have a pet with an orthopaedic condition you will have been referred to Beechwood Veterinary Hospital by your own veterinary surgeon. Once we have obtained your details from your home practice a member of our reception team will contact you to arrange a suitable appointment. Appointments are made as soon as possible in order of clinical urgency, fractures may be seen the same day.